Gail Storey was definitely not a hiker or camper. In fact, Storey liked to say, “I never much cared for nature, or rather, thought it okay as long as it stayed outside.” But when her husband, Porter, leaves his job as a hospice doctor to hike the 2,663-mile Pacific Crest Trail from Mexico to Canada, she refuses to let him go alone—even though the prospect of leaving their comfortable Houston home, hiking twenty miles a day at the age of 56 while popping antidepressants and hormones, and sleeping outside for six months terrifies her. Carrying Porter’s homemade ultralight equipment, they sizzle in the Mojave Desert, nearly drown fording a swollen river, climb icy mountains in the High Sierra, and stumble through the lava fields of Oregon. It’s not for the faint of heart. Porter had loved to bicycle to work, his dress pants, shirt, and tie rolled in his bike bag. Once he’d called me from his office in a panic. “I left my pants at home,” he said. I hopped in the car to bring them to him, while he hid behind his desk in his bike shorts. I made him chase me around his desk for them. Years before their venture to the PCT, Porter and Gail had set a goal for themselves to search America on what they called their Butterfly Route. Shaped like the wings of a butterfly, their journey included bicycle rides from Texas to Maine, and to San Diego, and major thru hikes of the Appalachian and Pacific Crest Trails. They accomplished the tandem bike trips, but Gail had failed miserably on the Appalachian Trail, quitting after only a few days. So she steeled herself when they tried again, this time on the PCT. The thought process beforehand was as grueling mentally as the hiking was physically. I made a mental list of reasons to hike the PCT: I wanted to have Porter even more to myself than I had on our bike trips, just the two of us out on the trail. I wanted to share the adventures of a life-time with him, to understand what drew him to the wilderness, but also to know the power of the wilderness for myself. Porter and Gail made a total commitment to hiking the Pacific Crest Trail. Porter quit his job as a hospice and palliative care physician. They sold the Houston house that together they made into a home with love of their environment and of each other. They spent months planning and strategizing each segment of the journey. Porter designed, built, and rebuilt many of the tools and apparel they would use along the trail, making everything lighter and lighter with each iteration. I was suddenly overwhelmed with regret. I could never go home to the house we sold, painted blue with red and gold trim like a cottage in a Russian folk tale. I missed everything about it – our walls and walls of books, candlelit bedroom, and sunroom where light streamed in between the white star jasmine. Why had we exiled ourselves from our garden of blue morning glories, red roses and hummingbird bushes, lilacs and orange trumpet vines? Would Porter succeed in his quest to find out who he was, beyond a hospice doctor and father to a now-grown son? Would my Good-Girl self, never good enough, and my Bad-Girl self, never bad enough to have the fun my Good-Girl missed, make peace in the space and adventure of the trail? After all our efforts to hone down our gear, we ourselves were being honed – by wind, sand, and the sheer effort of climbing and descending hour after hour, day after day. I was being stripped bare of the trappings of an unessential self — deconstructed, unmasked. After a rough couple weeks, they settled better into a thru-hike frame of mind. They developed habits, they worked as a team, they helped one another. They shared the load, they shared the chores, and they shared each other. After the vacation-like freedom the first week of our hike, followed by our scare in the storm, we settled into a rhythm of routines. With nothing to do but walk all day, buried feelings started to emerge. Wistfulness pervaded me, like the cool, gray light. I longed to be as clean and raw as the bare Coulter pines. In the morning, we put the stones and brush I moved back where they belonged. We adhered to the backcountry rule of “leave no trace.” I liked this feel of lightness and invisibility. Instead of creating oceans of waste, we stuffed our food wrappers and toilet paper into a small plastic bag. Our poop was buried deep in the dirt. Instead of a polluted carbon footprint, we barely made footprints in the sand. Even these we brushed with a fallen branch before we slipped back on the trail. The longer I stayed on the trail, the more invested I became in completing the whole six months. I had survived so much already. I was learning new outdoor skills every day. I’d learned something primal from Odin (a lost dog). He was lost and he surrendered, trusting us. I would trust where the trail was leading, trust myself. Who would I be when I finished the trail, or the trail was finished with me? Out here in this spaciousness, I was growing beyond my old roles – my mother’s worried daughter, my father’s estranged one. Party girl, spiritual seeker, indignant daughter-in-law. Even with its disturbances, my old life felt cocoon-like, familiar. Now it was cracking, rough and scratchy against my inner edges. The day on Porter’s digital watch seemed to read NOW, until we realized it was MON, for Monday, upside-down. What did it mean to live in the present? Not to rush toward Canada the way we rushed through our lives. Nor could we amble and hope to get there. We would walk our miles as consciously as possible. Physically though, Gail’s body was failing her. Despite eating 6,000 calories a day, she lost a lot of weight, dropping from 125 to 103 pounds. At 5’7″ in height, that wasn’t good. Early in the trek, she had injured her shoulder in a fall, and it just wasn’t getting better. She lost weight, she lost strength, she lost sleep, she lost her ability to cope. How could I explain how the trail both opened me up and wore me down? I was raw inside, hypersensitive to good as much as to bad. He’d hiked long trails before, didn’t he know they gave and took away? I walked way ahead of Porter, since we could see each other for long distances. I understood that his wanting time to himself had nothing to do with getting away from me, I too wanted to be alone with the silence. Once in a while I looked far back to see whether he was still there. Even when I couldn’t see him, we were still present to each other, graced with our respective solitudes in the shadeless, unlimited space. I searched for words for the spaciousness the mountain lion had led me into on the mountainside. “It felt so familiar, so natural.” The Mojave green rattler, with its venom poisonous to the brain and spinal cord, was a real danger here. But since my experience with the lion, I felt the peace of our coexistence. “Mountain lions don’t reveal themselves to everyone,” Porter said. I Promise Not to Suffer is a story of accomplishment, of perseverance, of fear and struggle. But most of all, it’s a story of Gail and Porter’s abiding love for each other and willingness to share experiences… whether failure or success. Love isn’t always easy. There are pitfalls along the trail to enduring, unconditional love; just as there are pitfalls along the Pacific Crest Trail. It is hard. The Pacific Crest Trail is hard, very hard. So too is love, but in the end, it is ever so worth it. I love you too, I said, to Porter, myself, and everyone I knew, ever have, or ever will. Yes, I enjoyed I Promise Not to Suffer. It’s witty. Storey has a self-deprecating sense of humor that makes her instantly likable. For a hiker considering a thru hike of their own, it’s enlightening. Storey doesn’t pull any punches. 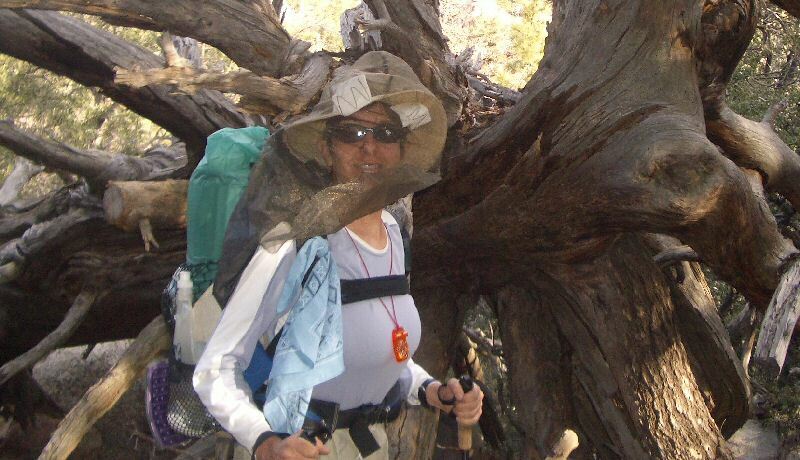 She tells it like it is about the Pacific Crest Trail. This is not an endeavor anyone should take lightly. A great feature of the book are the Appendices that include: how they built their ultralight gear, the food they packed and shipped to themselves to remain nourished, and lists for emergency preparation that would be useful not only for the hikers but for their friends and family back home. It’s thought provoking. Frequently I found myself asking the same questions as I read Gail’s quandaries. What do I fear? What am I made of? Do I have the guts to do something I’m completely apprehensive about because it’s a goal of the love of my life? How can I be better? Take a spin through your own mind as Gail Storey opens her’s in I Promise Not to Suffer. Gail D. Storey is the author of novels: The Lord’s Motel and its sequel, God’s Country Club, as well as stories, essays, and articles. Gail’s blog at gailstorey.com features photos and videos related to I Promise Not to Suffer. Her blog at amberstorey.com pokes soulful fun at pretty much everything. A proficient hoopdancer and trans-American tandem bicyclist, she is also notorious for jumping out of cakes. She lives in Boulder, CO with her long-suffering husband Porter, MD FACP FAAHPM, a national leader in hospice and palliative medicine. You can purchase copies of I Promise Not to Suffer from Gail Storey’s website, from Mountaineer Books, or from Amazon.